Despite knowing a luxury vehicle is in your future, it can still be difficult to figure out which one. The easiest way to decide between the top contenders is to place them in a table for a side-by-side comparison. So, we've taken the 2018 Mercedes-Benz GLE and compared it to the 2018 Audi Q5. This way, you’ll be able to see just what specifications and features these two vehicles have standard and available. The information shown below was taken primarily from the base trims of both vehicles, with the exception being the engine options, which is for the GLE model in general. If you are interested in learning more specs and features of other trims, you’ll be able to find the information on our website, or you can contact us. Now, let’s take a look at what we have found out about the 2018 Mercedes-Benz GLE, and how it holds up against the 2018 Audi Q5. As you can see in the table above, this was a close competition. However, there are a few things that makes the Mercedes-Benz pull ahead. If you are only looking at the base trim of both vehicles, you’ll see that the standard engine of the 2018 Mercedes-Benz GLE has more power than the 2018 Audi Q5. This means that if you want to have a powerful vehicle, you might want to go with the GLE over the Q5. This is furthered by the fact that the we’ve taken the horsepower from the standard engine you get on the lowest trim. The GLE actually has 4 engine options, including a hybrid option. The Q5 only has 1 engine option for all of its trim levels, so you won’t get that versatility. You might find yourself having more technology and comfort/convenience features in the Mercedes-Benz GLE as well. If you are looking for comfort features such as cooled/ventilated seats, you’ll be able to add that feature on to even the base model. However, if you are looking for that feature in the Audi Q5, you’ll need to pick a trim higher than the base. This is similar to the sunroof, which is standard on the base of the GLE as well. You can still have a sunroof on the Q5, but it isn’t standard, so you’ll find yourself spending more money to have that feature. 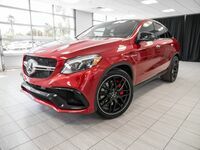 If you have any further questions on the 2018 Mercedes-Benz GLE then please don’t hesitate to contact us here at Mercedes-Benz of Arrowhead. Our team of experts will be able to provide you with more specs and features of this powerful SUV.